The report titled “Poland Warehousing Market Outlook to 2022 – By Geography (Warsaw, Silesia, Poznan, and Others), by Business Model (Industrial/Retail/Agriculture, Container Freight and Cold Storage) and by International and Domestic Companies” by Ken Research suggested a growth with a CAGR of 3.89% in terms of revenue in Poland warehousing market in next 5 years till the year ending 2022. 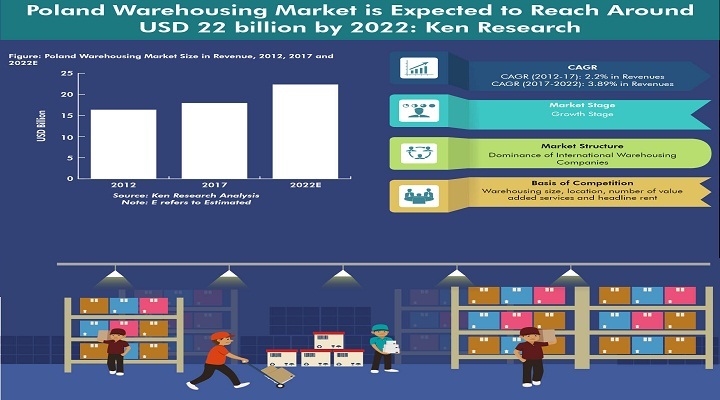 The primary growth drivers for the warehousing market in Poland have been the rise in manufacturing, retail and e-commerce industry, increasing number of industrial and logistics parks along with rise in international trade. The warehousing industry in Poland has witnessed substantial growth in the past few years. The overall investments in the warehousing market have significantly increased which has boosted the available stock space in the market and has attracted international players like Amazon, Zalando and others to set up their facilities in the country. The growth of the pharmaceutical, e-commerce, retail and FMCG market has further created demand for warehousing space in the country. To facilitate the development of warehouses across various regions in the country, the government has established multiple logistics and industrial parks across various hubs in the country. Rise in domestic consumption of food products along with increase in demand of frozen products has resulted in elevated demand for cold storage facilities. The demand for 3PL warehousing services is increasing with the growth of the industry. Warsaw (inner-city and suburbs combined) is the major logistics hub with the largest warehousing area. It is followed by Silesia, Poznan and other regions respectively. Warehouses for industrial, retail and agricultural products contributed the highest share of revenue to the overall market. Container freight warehouses contributed the second highest share of revenue followed by cold storage warehouses. The warehousing market is dominated by international companies which are global players, whereas domestic companies comprise of only a few large companies and mostly smaller players.